WinsterCavers.org.uk exists to share with you some of our experiences both above, and below ground – to aid adventurers of reasonable ability and sound mind in exploring new ground, and to help them find information where we have sometimes struggled. The site contains a growing collection of “mini travel guides”, based exclusively on our personal experiences. More than just a blog, these travel-log style guides are intended to inspire, inform and occasionally amuse. Browse these pages, and you'll find a mix of walking guides, maps, cave descriptions and cave surveys / cave route descriptions and much more - all supported with a series of original photography, "How to get there" guides and various anecdotal notes. You are more than welcome to print off any of our travel guides, route plans, etc. for your own personal use, but please remember that they are not, and cannot, be complete in every detail, but rather should help to point the reader in the right direction, without taking away the element of adventure. Nor are the guides a substitute for good practice either above or below ground, and those new to caving, walking, volcanoes, etc. are strongly encouraged to seek guidance as appropriate – either by joining a caving club, a mountaineering club, using the services of a professional guide, or whatever suits the situation. Above all though - enjoy! Rather than make lame excuses about life being busy and promise we'll write stuff up which then doesn't happen, perhaps it is better to accept that updates here will happen when they do, and not when they don't. The Winster Cavers Facebook Page does, however, make a handy place for the occassional informal post. So if you haven't yet 'liked' our Facebook page, please do. June saw a return visit to Sicily - a great time was had, predominantly walking in the Nebrodi, but with a somewhat stronger emphasis on relaxing than previous visits it didn't quite make the blog. As always, there's a story behind this. But this is also a return trip we've been thinking about for a while - it's just simply an amzing place to go hiking. We have two big hut-to-hut walks planned over a two week visit with, hopefully, just enough slack/recovery time to make it all achievable. What's for sure, is that there'll be a good bar story or two at the end of it. There always is with us! Yes - we're off again. No volcanoes this time, instead a 10-day trek through Morocco's High Atlas Mountains, which should culminate in topping out on the two highest peaks in Morocco - Mount Toubkal at 4167m, and Mount Ouankrim at 4089m. 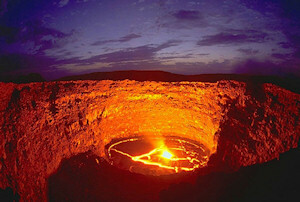 We're exploring the possibilities of visiting the famous lava lake of Erta Ale in Ethiopia and the Danakil Desert. We could do with up to 4 people to join us to help reduce the cost per person. As with most of our adventures, you'll need to be reasonably fit, but not super-human, to be up for an adventure, have a good sense of humour and a sound outlook on life. We are lookng to travel either early 2014 (January - March) or later 2014 (November to December) as the climate is somewhat cooler then. Fancy it? Get in Touch! We've also polished off the Indonesia volcano expedition blog, including adding a few photos. Internet access is going to be very intermittent whilst we're on expedition - neither of the remote islands we're travelling to have clean water, and Pulau Komba is completely uninhabited. We'll still be keeping the blog, and just uploading chunks as and when we get a chance! We'll also be updating the Winster Cavers' Facebook page when we can. The Winster Cavers are heading back to Indonesia in June 2013 - this time to visit the remote islands of Pulau Komba with its active volcano, Batu Tara, and also Paluweh - which has recently been building an active lava dome and producing sporadic ash eruptions, with ash clouds reaching 7km+ high. We finish by climbing Mount Welirang, which has sulphur mining akin to that at Kawah Ijen. The 9 short videos of our previous visit (below) will give you a taste of what to expect - but this trip is definitely billed more as more of an "expedition", with facilities on the remote islands of Pulau Komba & Paluweh being somewhere between very limited and non-existent. There is still time (but not much!) for a couple of people to join us on some or all of our travels. You need to be reasonably fit, but not super-human, and you need to have a good sense of adventure! If you want to know more details, please contact us now. September 2012 - More Lake District Walks. August 2012 - Winster Cavers on Facebook! We've just set up a new Facebook page so we can promote new material on this site, and share with you some of our less formal moments! We also intend to (gradually) fill in the timeline with details of our adventures! Just 'Like' the Winster Cavers on Facebook to keep up-to-date. June 2012 - Sicily, again. It seems like a long time since we've trodden the slopes of our favourite volcano, Mount Etna. And in the two years since we visited, much has changed - the current eruptive phase has featured 25 separate paroxysms, mostly from the "new" South East Crater, making Etna one of the fastest growing volcanoes in the world. Follow our blog as we tread ground old and new - very new! June 2012 - hiking on Mount Etna and in the Madonie Mountains, Sicily. March 2012 - New walking information - Climbing Mount Teide, Tenerife. Essential information and route options for anyone wishing to climb Tenerife's highest mountain, El Teide. January 2012 - New photo gallery - Upper Flood Swallett. Just before Christmas we had an excellent trip into the extensions in Upper Flood Swallett, Mendips, Somerset, UK. Here are a few of the photographs from the trip. Upper Flood Swallet photo gallery - Mendips, UK. September 2011 - Volcano trekking and caving in Java. September saw us travelling again - this time to visit several of the volancoes on the Indonesian island of Java. Just published is a small selection (76) of the photographs we took. Indonesia photo gallery - volcano trekking and caving. Sicily's Mount Etna is currently in eruption again from the New South East Crater - the tenth event so far this year. Spectacular views of this eruption - a stunning fire fountain and a lava flow advancing towards the Valle del Bove can be seen at the EtnaTrekking webcams and the Radio Studio 7 webcams. The "Grand Lady" has gone back to sleep for now. If you missed this event, you can still expect to see more activity at this lively European volcano in the coming weeks. August 2011 - Two new photo galleries underground in Derbyshire. June 2011 - Caving in Ireland, and new walking guides. May 2011 - New Derbyshire walking guides. Recent public showing of "From Ore to Orchids". Our joint DCRO/Silence Mine project fund-raiser - an evening of film in aid of Derbyshire Cave Rescue and the Silence Mine Heritage Site - in which we showed "From Ore to Orchids" along with Dave Webb's new and extended version of his film on the High Rake project raise a very respectable £350 for two worthy causes - a big THANK YOU to all involved. February 2011 - Etna eruption photo gallery, and another walking guide. New on-line is a photo gallery of eruptions on Mount Enta between 2004 and 2008, and another Peak District walking route, this time a walk around Froggat Edge, Curbar Edge and White Edge in Derbyshire's Dark Peak. Coming soon we have some more walking in Wales, caving in County Clare, Ireland, and if all goes well, a volcano tour of Java, Indonesia... Watch this space! Looking for information on Winster, Derbyshire? To find out all about Winster village, visit the Winster village web site. For a veritable mine (excuse the pun!) of information about the historical family trees of Winster, immerse yourself in Dawn Scotting's amazing Winster Ancestry web site. High power LED caplamps for Caving, Mining, underground exploration, night and confined space working. We are currently accepting requests to advertise on this website. For details of advertising rates, placement options and terms and conditions, please contact us. We've been putting some of our video on You Tube - here's a taster!